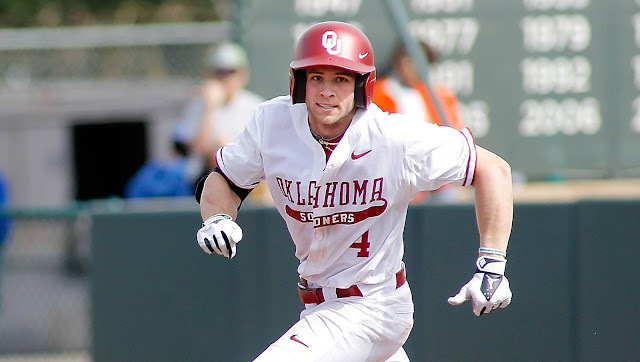 University of Oklahoma baseball senior left fielder Hunter Haley (Nacogdoches, Texas) was named a Louisville Player National Player of the Week by Collegiate Baseball News on Monday. Haley powered the Sooner lineup with a Big 12-leading three home runs in a 3-1 week at home. Oklahoma has had three players named National Player of the Week by CBN in the last three seasons as Haley joins former teammates Kolbey Carpenter (2/23/15) and Mac James (3/10/14). Haley’s honor marks the first weekly award for the Sooners in 2016. Haley hit .429 (6-for-14) and slugged an impressive 1.071. To go with his three home runs, he added eight RBI and three walks for a .500 on-base percentage. Haley posted three multi-RBI games and two two-hit games. He drove in two on a two-out base hit in the first inning against Dallas Baptist on Tuesday night. In the series opener against Baylor, Haley cracked a two-run home run. He followed with a 2-for-3 performance on Saturday before capping off the weekend with a 2-for-4, two-home run, four-RBI game on Sunday. It marked the second two-home run game of his career and the first for Oklahoma since Carpenter did so against Utah (2/22/15) ahead of his National Player of the Week nod. On the season, Haley has gone yard four times with 19 RBI. In his career, he has 16 home runs and 94 RBI. The Sooners hit the road this week starting with a Tuesday night non-conference game at Wichita State at 6:30 pm.